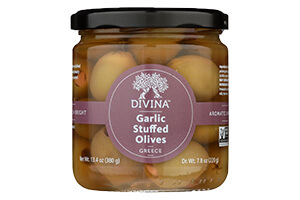 Crunchy garlic cloves surrounded by meaty, buttery Halkidiki olives. A popular crowd pleaser. Ingredients:Halkidiki green olives, water, garlic, sea salt, citric acid.